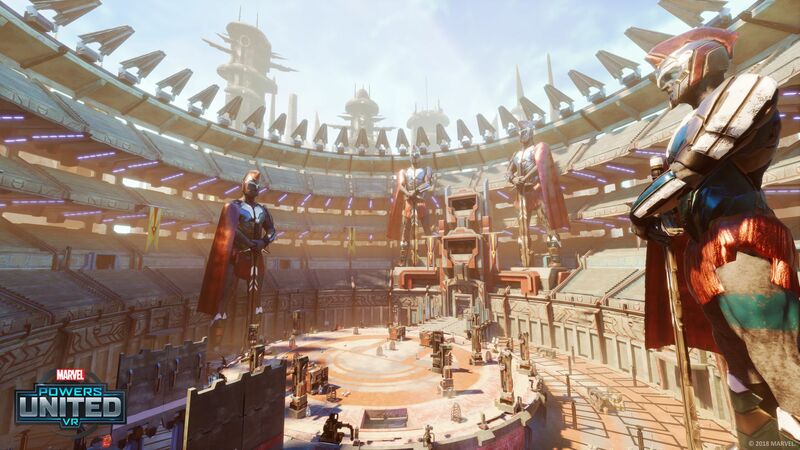 The Sakaar arena from Planet Hulk is another revealed battlefield as well. Hawkeye: Orphaned at a young age and protégé to a master archer, Clint Barton is one of the world’s greatest marksmen. His archery skills have be honed through rigorous training and commitment to never miss a shot, and his ability with a bow and arrow is equal to the superhuman powers of many of his teammates and foes. His Bow Shot and combination of specially tipped Trick Shots keep him even on the battlefield with his team and the enemies they face. Black Widow: A specialist in espionage, Natasha Romanova finds her true calling as the Black Widow! Using her highly trained-and deadly-skill set to protect the world, Black Widow brings a decisively strategic element to the team with her Widows Bite gauntlets, elite marksmanship, and unmatched espionage excellence. Black Panther was also revealed recently and his hometown is being added as one of the venues for Marvel Powers United VR's adventures. Wakanda is one of the newly revealed play areas along with Sakaar Arena, an area inspired by the Incredible Hulk story arch "Planet Hulk". Sakaar was also given shine in the Thor: Ragnarok film. Rocket Raccoon, Deadpool, Captain Marvel, Hulk, Crystal, Blackbolt, and Thor round out revealed characters with Marvel Powers United VR set for a July 26, 2018, launch and pre-orders available right now. Leading up to the launch, more characters will be revealed, so stay tuned to Shacknews for more updates. Never heard of this, looks like it could be fun.